Friends. What a subject to embark upon! Like me, I'm sure you've been in seasons where you didn't have many friends (or any!). Truly, a good friend can be hard to find. But then again, maybe years later (like me! ), you find yourself surrounded by an incredible group of friends. I know that God answered my prayers more than I could have ever thought! And He certainly answered them in a different way than I expected...for instance, not one of my friends is my age. The age range of my very dear friends ranges from a year younger to six years older! That's quite a jump, isn't it? But today, rather than merely examine my own friendship story, I want to discuss godly friendships. What are they, who are they, and how can we find them? Let's start with the first question - What are they? Well, this could take many posts itself, so I can only answer it very briefly. Our idea of a best friend might be someone who has the same tastes in everything from movies to food, who can finish our sentences, and always provides a fun time. Excellent qualities, to be sure. But there are some more things we should think about cultivating in our relationships, instead of just a fun day at the movies. According to Elizabeth George, in her book A Young Woman After God's Own Heart, godly friends are loyal, understanding, sensitive, encouraging, understanding, honest, and pull you and along in your journey with God. Now that's quite a list! I'm ashamed to admit that I don't meet all those standards myself. But looking at some Bible verses, I would say that the most important quality in a friend is that she loves you, for yourself. She accepts you, knows you well, and loves you even though what she sees may not always be pretty. As the Bible says, "Love covers a multitude of sins", and "A friend loves at all times." Not all our friends will be "sharpening". There is nothing wrong with loving a friend and reaching out to her, to just having fun times together. But we become like those who we spend the most time with, so assess your friendships and see if you need to find one or two new friends, or take a friendship in a new direction. I've done the latter, and am still surprised sometimes how it's worked. The final two questions, who are they? and how do we find them? are relatively easy to answer. Obviously, the "who" for a godly, sharpening friend, must first be a Christian. As for the last question, it is easy to answer because I don't know the answer. Obviously, those in your own family are to be closest to you; I count my older sister as one of my very best friends. But for those who aren't related, pray for God to send you friends; be cheerful and encouraging to those you meet, and reach out to others. Don't always expect a friend to find you; you do your part and try to find them. Now, thank God for the wonderful friends you do have! 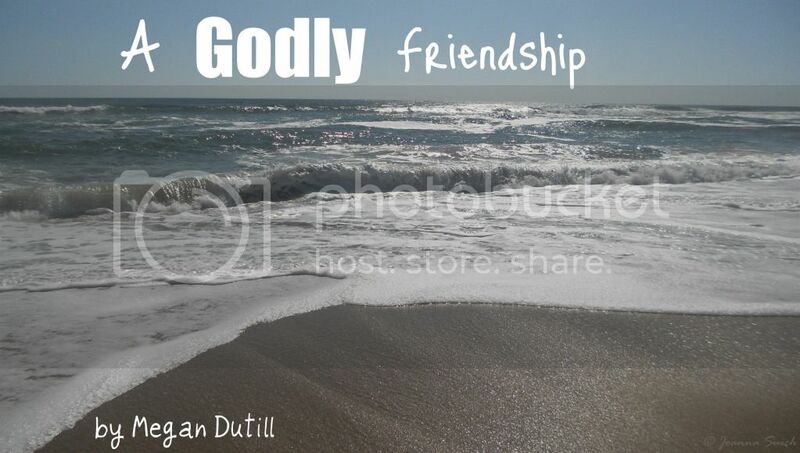 And while you're at it, join me in the prayer that He would continue to mold us into that kind of desireable friend.